Osvaldo Gutierrez Gomez also known as “Osval“ was born on 26th September 1971 in Ciego de Avila, Cuba. He graduated of Social Communication at the Maximo Gomez Baez (UNICA) in Ciego de Avila in 2012. He worked as an editorial cartoonist in the provincial newspaper „Invasor“ and currently works as a photo reporter for the Cuban News Agency (ACN). Osvaldo started drawing cartoons in 1985 and his first cartoon was published in 1986 in the newspaper „Palante“. Since that time his artworks have been published in several Cuban periodicals. Currently collaborates with Cuban publications as Dedete, Melaito, Pallas and the Picua. Furthermore publishes in „cartoonmovement.com“ internationally. Osvaldo Gutierrez Gomez presented his cartoons at solo exhibitions in Art Gallery Raul Martinez de Ciego de Avila in 2014 and 2015 and collective exhibitions in Gallery of the Council of the Plastic Arts of the Province of Ciego de Avila in 2016 with Michel Moro… Some awards: Political Satire Prize at the National Salon XII graphic humor San Antonio de los Banos, Museo del Humor; Cartoon Award, organized by the humorous magazine Palante in its 45th anniversary; 3rd Prize at the XIX International Biennial of Humor, Havana, 2015, etc. In addition to his activities in cartooning Osval also focuses on the photography. He is a member of UNEAC (Union of Writers and Artists of Cuba). 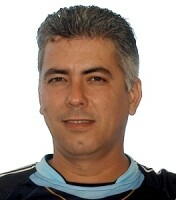 Osvaldo Gutierrez Gomez lives and works in Ciego de Avila, Cuba.